Is it possible to imagine two landscapes as different as the mischievous fishing village Myken, 35 kilometers into the sea west of the Helgeland coast, and the rolling hills of the Cognac district in western France? Is it possible to find common ground between these two so different places? Actually, yes. The answer is Norwegian-produced whisky stored in French cognac barrels. In a few years, we will know if the experiment will be successful. But we somehow have the feeling that chances are good. Bache-Gabrielsen has been a producer of first-class cognac for over a hundred years. The company represents a Norwegian portal into the French spirits culture. Thomas Bache-Gabrielsen, from the small city of Holmestrand, was an adventurer. He did not intend to sit with his hands in his lap, waiting to see what life had to offer, but rather take command of his own destiny. The result is well-known: By the turn of the century, he became a producer of high quality cognac gaining a large audience worldwide and particularly in Norway. No other manufacturers of cognac have sold that much of this wonderful liquid on Norwegian soil. Myken is a picturesque fishing village hosting ten permanent residents, located in the municipality of Rødøy, 66 degrees north, three miles outside the Helgeland coast. The waves sweep in from the Norwegian Sea 365 days a year. Here, hardly anything grows other than the most hardy of plants: Grass, peat, moss, low and short-stemmed flowers, clinging to the cliffs to the best of their abilities. But out here next to the open sea, some creative people have settled down. Roar Larsen and Jan Hellstrøm came to Myken a few years ago and were summoned by its magnificent nature. They got this wild idea of ​​establishing a distillery – the world’s northernmost – and now making whisky and gin receiving brilliant reception in the market. The quality of a liquor is entirely dependent on first-class ingredients. Without this prerequisite, one can forget about all aspirations to create something that really matters. The whisky from Myken is made of desalinated seawater, deriving flavor from the sea. It is said that really fresh seafood should first and foremost smell of sea. One might ask – what does sea water really taste like? Is this something enjoyable? The whole world knows the answer to this question is yes, similarly so with the sea water used to produce whisky. The aromas are not intrusive, but the floral shades add a unique character to the final product. In addition to the desalinated sea water, the climate is crucial. Some of the world’s finest whiskys are produced in rugged parts of Scotland, and the Myken climate has many common denominators with the places where the Scottish distilleries are housed. The temperature is never high, but never too low, and the humidity is high. All of this contributes to the taste of the distillates stored here. 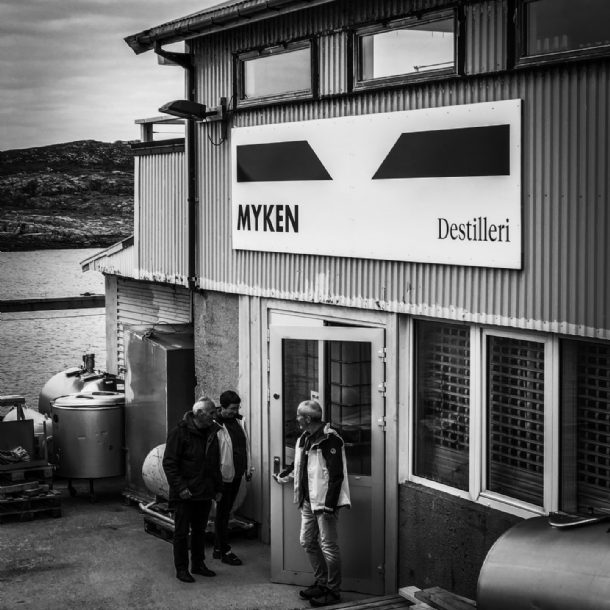 A few years ago, Hervé Bache-Gabrielsen got a tip about the distillery on Myken, and last summer he travelled up and out to the island to look at the landscape, meet the people and taste the distillates. Being so excited, he bought 1000 liters of fresh distillates and made a plan: What would happen if we add this raw material to old French cognac barrels, carry them to Cognac and let them evolve in our cellars down there? Sometimes an avalanche only needs a tiny push. 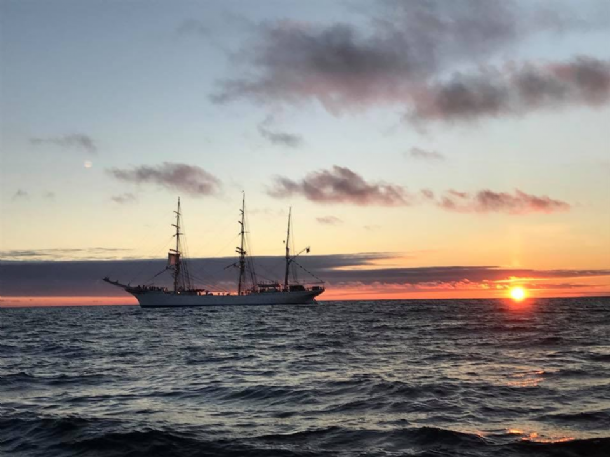 The first three barrels are now being transported by boat to Bergen, and from there with a truck to the deep basins of Cognac, located in the heart of Europe at the 45th latitude, more than 20 coordinates south of Myken. Of course, you could have put the dish on board a modern truck and headed south, but why not take a boat ride? After all, this is a true innovation in the liquor world. 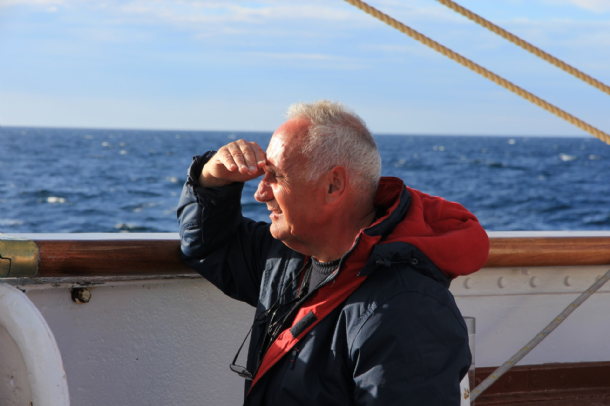 Christian Bache-Gabrielsen, a now 75-year-old retiree, Bache’s director from 1968 to 2011, joined the Norwegian sailboat Statsraad Lehmkuhl, one of Norway’s finest ships regardless of category. 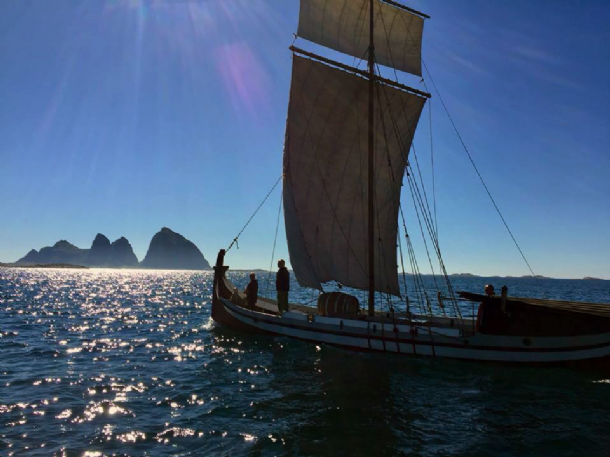 Sailing a splendid bark from 1914 with the spectacular view of the Norwegian coast as a backdrop. Life could be worse. 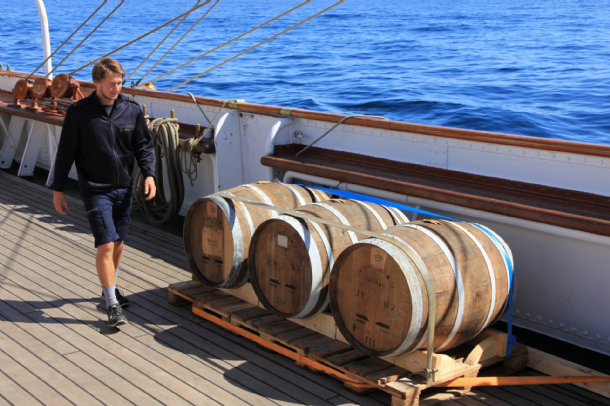 The barrels were loaded on board in Lehmkuhl, with Christian Bache-Gabrielsen for the occasion employed as “caretaker”. The journey went down along the coast down to Bergen, where it arrived on the 12th of July. Can a sea trip be more magnificent than this? In Bergen, the barrels were loaded on trucks and driven to Cognac, where the gems were laid in the basement, getting a taste of the oak barrels previously containing high quality cognac. What flavors will develop in this process? Hard to predict, but in three to four years, cellar master Jean-Philippe Bergier, the virtuoso in charge of this position at Bache since 1989, will taste the goods. If everything goes according to the plan, about 1500 bottles will be available for the market. You do not have to be psychic to predict that there will be a rift. Join the queue.